If just reading the word “debt” makes your pulse increase, you’re not alone. Most people see money owed—regardless of the amount—as both daunting and shameful. Rather than weathering the fiscal storm, they tell themselves that assessing their financial standing can wait. All the while, the debt, and associated anxiety, builds. This IOU black cloud is detrimental to all-around wellness, not only in the present but also in the distant future. As Ariel Kiley, a yoga teacher and transformation guide, explains, mismanaged money makes planning for larger life goals almost impossible. But once you’ve found financial security—by paying off debt and budgeting—Kiley says you can make confident decisions on where you want your life to go. “It’s all within my control,” Kiley says, “and the security makes me move so much more peacefully through this world.” We sat down with Kiley for tips on getting rid of debt and finding financial peace. Here are her five steps for getting out of debt. In 2017, Kiley was carrying $36,000 in debt. Though she’d earned enough in the previous years to pay the money off, she somehow hadn’t made headway. She was frustrated but also determined. After reading books and listening to podcasts on money management, she created a get-out-of-debt program for herself. As a yoga and meditation teacher, living in one of the most expensive cities in the world, Kiley had to continuously recommit to her mission. “Just like training for a marathon, you focus, you follow the plan,” Kiley says. Running 26 straight miles or paying off $36,000 feels insurmountable initially, but “a few months later, you’ve run that distance or you’re out of debt.” And indeed, just 10 months later, Kiley was completely debt-free. 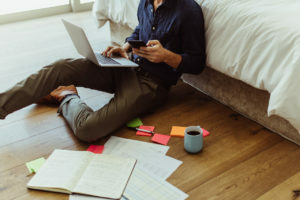 Before taking a deep dive into your finances, Kiley suggests taking a moment to recognize that becoming money conscious is brave. The decision to change is often the hardest hurdle to jump over. Write down all your assets (e.g., cash, stocks, bonds, savings, collectibles) and all your liabilities (e.g., student loans, mortgage, credit card debt). Then put that paper aside and think about where you want to be financially in two, three or five years. Your long-term goal might be zero student loan debt, $10,000 in savings or even money for a down payment on a house. “I think anything is possible in five years,” Kiley says. Once the goals are clear, you can start to connect where you are now to where you want to be. Track every single dollar you spend for an entire month. At the end of 30 days, Kiley says to sort your expenses into categories, like home, food, entertainment, transportation, travel, beauty, etc. Look at the choices you’ve made and determine whether they touch on your value system or reflect a lack of preparation. Kiley likes to label each purchase as essential for your survival, essential for your spirit and extra. “The reality is,” Kiley says, “we’re all paying a ton for that third category, which is extra stuff that’s not nourishing you.” All the extra expenses drain not just your bank account but also your time and energy. Seeing exactly how much of your hard-earned cash is going toward coffee and pedicures is both maddening and motivating. At the start of each month, Kiley added up her checking, savings and Venmo accounts, plus all cash, and that was her budget. “I wrote out a list of each category of spending and planned what I would pay in each one,” she explains. Any leftover money went to debt payments. In the beginning, when you’re still learning to make cuts, the leftover amount might be small. “My first month, the extra money that went to debt was $600 … by the 10th month, I was contributing $6,000,” Kiley says. Once cuts become second nature, you may want to eliminate the “essential for the spirit” category entirely. Kiley warns against, though; she believes a little indulgence helps bolster commitment. Kiley calls credit cards “debt in disguise” and always carries cash to help avoid budgeting slip-ups. “When you feel cash leaving your hands, it registers in pain centers in your brain so you spend less,” she says. Kiley puts cash into categorized envelopes at the start of the month. If she wants to see a play but her “entertainment” envelope is empty, she simply waits until the next month or finds a workaround. Kiley actually found these workarounds exciting. “We throw money at problems without thinking about the real solution,” she says. When she wanted to meet up with a pal but didn’t have the cash for a restaurant, she truly thought about how she wanted to spend her time with that particular person. This resulted in hangouts that were more authentic. Kiley thinks the tedium of budgeting is well worth the eventual freedom. She believes that gaining personal agency over the life you want to create is an empowering process of self-realization. Managing your financial worth helps you realize your spiritual worth, and that, she says, is priceless. Julie Fishman is the co-host of First Timers, a podcast about blowouts, belly laughs and all the other "firsts" in parenthood, and co-author of “The Little Black Book of Big Red Flags” (2011). Her writing has been featured at Popsugar.com, Complex.com, Mom.me, Mandatory.com, MSN.com and in the book, “Gradspot: A Guide to Life After College” (2008). She’s a mom to two girls, one dog and a bevy of Barbies that her fournado has demanded she also parent.